So the story about Colin "Lord Chaos" Campbell's e-mails has been active for about a full day. Originally, I elected to bite my tongue, confident that the right questions would be asked. How wrong I was. To those who aren't familiar with this story, hockey blogger Tyler Dellow posted an article yesterday (Sunday) that started this whole thing. Dellow had found this court decision on a wrongful firing suit filed by former NHL referee Dean Warren. Warren claimed he was fired for his union work, so the NHL had to show evidence of his failures as a referee. To do so, they submitted into evidence, among other things, several e-mails between Colin Campbell and then-Director of Officiating Stephen Walkom. These e-mails had been redacted, but some had enough details that they could be traced back. Dellow, after what I'd imagine was a great deal of investigative work, pinned down two specific penalties. The one that got the most attention was a call in which Campbell's son, Gregory Campbell, was given a high-sticking penalty against Marc Savard. Campbell called Marc Savard a "fake artist" and just showed a general dislike for the guy. There were two specific charges that followed -- that Campbell was unfairly biased towards his son, and that he was unfairly biased against Marc Savard, and that this affected his judgment when deciding to suspend Matt Cooke. "There's no question that there's a perception of inappropriate behavior when Colin Campbell sends an email within the office to Director of Officiating at the time Stephen Walkom. As for the specific charge that maybe Marc Savard would not get a fair shake in the Matt Cooke hearing when Matt Cooke delivered the knockout blow to him because Colin Campbell called him a little faker at some point I can only tell you this: I don't have e-mails to prove it, but I would venture a very strong guess that whatever Colin Campbell and the NHL Hockey Operations Department think of the way Matt Cooke plays the game is far worse than whatever Marc Savard would be deemed in terms of being a 'little faker.'" He then went on to cite the Cooke-Savard hearing as an example of Campbell's integrity. I sort of agree on that point -- Campbell probably wanted to get Matt Cooke and didn't. "The key thing to note here is that the emails in question were exchanged three years ago. On March 29, 2009, Steve Ott nearly decapitated Colin's son, Gregory Campbell. Ott, a repeat offender, was given no suspension." That would be very interesting if Campbell had anything to do with that hearing. Campbell, of course, recused himself. Safeguards exist to prevent his ruling on hits on his own son. What about Greg Wyshynski of Puck Daddy? "I believe those holding up emails that deal with his son and malign the reputation of Marc Savard of the Bostin Bruins as a smoking gun that Campbell's been unfair to him are, ironically, being unfair to Colin Campbell [...] We don't have evidence that his personal feelings on Marc Savard (oddly not addressed in the TSN statement) contributed to any action taken (or not taken) in cases with which Savard's been involved." Again, this is true, but missing the point, although to his credit, Wyshnyski does spend a lot of time on the real concern. The one that's been all but ignored. Of course Colin Campbell didn't let his grudges impact his decision not to suspend Matt Cooke. Campbell isn't that kind of idiot. Campbell would never use his power to further his personal grudges. That's a sure-fire way to get caught. The evidence shows, though, that while Campbell didn't abuse his power, he did abuse his position. "Stephen and I would have banter back and forth and Stephen knows I'm a (hockey) dad venting and both of us knowing it wouldn't go any further than that. Stephen would laugh at me." Really? Let's take a look at this "venting." Keep in mind that these e-mails aren't the only ones that took place -- they're just the only ones with Dean Warren's name on them. The following is an e-mail from Colin Campbell to Stephen Walkom that took place in October 2006. The names and dates were redacted Some expletives have been cleverly replaced, and are marked in green. "Are you trying to f____ with my head? Sending this guy back into …..after the …..call and others? Have you talked to him yet and have you seen the penalty he called on [player]? Should I call him? Talk to [another referee] he will tell you the [pony poo] game Warren had and how hard it was to work with him. This guy is in serious trouble. He will be in trouble as soon as [coach or general manager] sees him tonight…they will think you are shoving it up their [fanny]. Maybe you should call [general manager] as a pre-emptive strike but talk to Warren first." "The first contact which occurred after Mr. Warren’s election to the OA executive was on October 23, 2006. The names of players, coaches, club officials and teams have been redacted." Splendid! This e-mail happened on October 23. From the comment, "He will be in trouble as soon as [coach or general manager] sees him tonight," it's clear that this refers to a game Warren was going to officiate on the 23rd. In other words, this game, between the Florida Panthers and the Atlanta Thrashers. Warren has clearly done something to anger one of these two teams recently. So what was Dean Warren's mistake that was so egregious that Campbell was furious he'd be sent back to officiate another game with the same teams? The only other time so far that season that Warren had been at a Panthers or Thrashers game was on October 21st, between the two of them. It was a home-and-home series. This is the box score for that game. So what, right? As Greg Wyshynski has pointed out, part of Colin Campbell's job is to assist the Director of Officiating in oversight of the referees. The only problem is, Gregory Campbell was playing for the Panthers, so Colin Campbell was complaining about a penalty that may have cost his son the game. "Because of the potential for a conflict of interest, or more importantly a perceived conflict of interest, the League has implemented various structural protections that prohibit Colie from having any oversight or disciplinary authority relating to any game in which his son, Gregory, plays. Its always fair to question and criticize League decisions as being wrong, but not on the basis that they aren't justly and fairly arrived at." "Spoke with [general manager] and spoke with dean …." So Colin Campbell's ranting led directly to the referee at that game getting a call from his boss about it, right before officiating another of the games in which Colin Campbell's son, Gregory, played. Despite Daly's carefully-worded insistence that the rules say Colin Campbell can't influence the officiating in his son's games, the evidence clearly shows that he has. "A bend in the road is a dead end if you round the corner and Dean Warren is standing there. Your answer re: his high stick calls and the score of the game were [the feces of an equine]. 1) The 3rd call on [player] was while they were down 5 on 4 and on a def zone face off vs that little fake artist [player] I had him in [city] biggest faker going. And Warren fell for it when he grabbed his face on a face off. Your supposed to see the act, not call the embellishing act. 2) Dean Warren has to go with [referee] There must be a way to get rid of this guy. Is there a way we can tract (sic) and total minors called by referees this year. We could then get the minors they call per game. … or with 2 [referees on the ice] it is impossible? 3) Warren and [referee] out of [club’s] games. Give them to [referees]." Wow, Campbell is mad here, too. By far, the most-discussed part of the e-mail was part 1. People unfortunately tended to look at what it means and not what it is. Don't look at it to determine Campbell's opinion of Marc Savard and if that would cause him to act with bias. Look what Campbell is saying to the then-current Director of Officiating, and his subordinate: Marc Savard is a horrible faker. This comment is clearly influenced both by his coaching of Savard in New York and his anger over his son's being assessed a bad penalty. Neither of these things should be factors when talking to the boss of every NHL referee. Suppose that Campbell's comments here are biased, and that they in some way influenced Stephen Walkom's decisions as head of officiating? Wouldn't that, right there, constitute an abuse of his position? But it gets worse. Here, in this e-mail, Campbell states "Dean Warren has got to go" (2). Cats and kittens, here we have direct evidence that Campbell's decision that Dean Warren must be fired was influenced by a call he made against his son. Right there. It's fortunate for Campbell that the names and dates were redacted and that Warren's attorney apparently didn't catch who this call was made against, because in a wrongful termination suit, this e-mail would be solid gold. "Your honor, this e-mail proves that I was fired not for making a mistake, but for making a mistake that negatively affected the son of the Director of Hockey Operations." But even if that wasn't the only factor in his firing, look what happens at the end of the message (3). Colin Campbell says, straight up, Warren isn't allowed to referee a certain club (presumably either Florida or Boston). Let's make sure to get the word out to all NHL'ers. Get a bad call against you? Colin Campbell will be there to make sure that referee never calls your game again. Or does that privilege only apply to those who are his son? "Can we use this [dookie] [the emailed clip] to remove him or is there an HR excuse." This e-mail makes it fairly clear that Campbell is already trying to get Warren fired. He's asking if he can use the clip to accomplish the goal of removing Warren. The question of whether Warren should be removed is not discussed. "I think we have that data but it may work in his favour. That why I'm against data." So here's a conversation in which Steve Walkom is telling an angry Colin Campbell that the numbers don't justify firing Dean Warren, and trying to help his boss to find an excuse to fire him. Does Walkom really think Warren deserves to go, or is he just trying to please his superior? "As for the emails, and sending them to Stephen Walkom, that's inappropriate behavior, and it gives the perception. Now, nothing was ever acted on, that we're aware of, because the referees that Colin Campbell complained about to Walkom, they're still working in the National Hockey League." That's simply not true. In fact, two of the three e-mails we have about calls on Gregory Campbell refer to Dean Warren. Not only was he fired, these very same e-mails were used in trial as evidence of Warren's shortcomings as a referee. In other words, they were shown in court as the reason Dean Warren was fired. Not only can we say that one of the referees in these e-mails lost his job, the NHL asserts that he lost his job because of incidents in these e-mails. "You can't tell the fans and media that Gregory Campbell is persona non grata in your role as NHL VP of hockey operations and then inquire about penalties he's been given with an email to the director of officiating. You're saying one thing, doing another, and "just a hockey dad venting" doesn't absolve that; if he's off-limits then he's off-limits." Well put. Unfortunately, it goes farther than "inquiring" about penalties Gregory Campbell's been given. So far, he's had a referee removed from games because of a penalty regarding his son. He also may have attempted to negatively influence a player's reputation among officials while angry for his son, and he's used these penalties to get at least one NHL referee fired. That's more than just egg on your face. Let's hope Dean Warren sues for wrongful termination again, this time for unfair favoritism. "Game not televised. Radio announcers said it was a [male bovine manure] penalty…you need to find out for me. How…I don’t know but this was awful. 1:30 left in 2-1 game for [team] and [player] scored with 2 second left to tie it up them won in OT. [MAKE LOVE TO]"
Now, Colin Campbell insisted this message was just banter, but Walkom clearly took the "you need to find out for me" seriously. He responded that he'd find out. Less than an hour later, Campbell is nagging him about it. "Did you find out anything? It was [another referee] that made the call. Keep Warren and gas this [doodoo]head. 90 seconds left and he calls a weak penalty…tripping. Makes me sick. If I was at the game I would have had to fine me." So a couple points on this. First, and most damning, is that Campbell is clearly very upset about a call he never saw. He heard from the radio announcers, he says, that the call was bad. Are we to believe that every time Colin Campbell hears someone claim a call is bad, he immediately e-mails the Director of Officiating to investigate? Absolutely not. Further, Campbell says to "gas" the guy who made the call. While he's indicated that he hasn't seen the play, he's willing to go after the referee who made the call. "The player who was penalized? None other than Gregory Campbell. Brian Pochmara and Don VanMassenhoven were the referees in that game and both are, as far as I can tell, still NHL referees." So no one got fired over this call. I guess that's good, because it's a dangerous precedent for the Director of Hockey Operations to get a referee fired over a call, then watch it. Still, once again, this e-mail is regarding Gregory Campbell, and daddy is very upset when referees call penalties on him. Is it true that, as was suggested by the ruling of Warren v. National Hockey League, that penalties called against Gregory Campbell were a major factor in his father's pushing for Warren's firing? How often does Colin Campbell bar referees from officiating for certain clubs after a bad call? How often does Colin Campbell direct his subordinate, the Director of Officiating, to investigate calls against his son? How often do calls against Gregory Campbell influence his father's decisions regarding which NHL referees should be let go? How often does Colin Campbell complain to the Director of Officiating about calls he has not even seen, and what percentage of these incidents related to his son? Forget Marc Savard. Forget Matt Cooke. Colin Campbell is unfairly using his position as the Director of Officiating's superior to help his son, and to fire at least one referee who's wronged him. That's where the story should be. NOTE: Speaking of corrections, this blog has been edited. Originally, it erroneously speculated that the call from October 21st had been one on Gregory Campbell. After I wrote it, I read Tyler Dellow's follow-up, in which he referenced a comment of mine, and a later comment that wasn't visible after his site went down. The later comment, from Colby Cosh, demonstrated that the penalty that had Colin Campbell up in arms on October 23rd was not called on his son, but his son's teammate, Martin Gelinas. I had previously narrowed down the call to be either on Gregory Campbell or Martin Gelinas, and Cosh's clever investigation of headlines from that night determined which it was. However, as Dellow pointed out, this is still a clear instance of Campbell directly affecting his son's games, which Bill Daly insisted never occurs. While the point remains very-much intact, it would be criminal not to fix factual errors whenever they're caught. Much credit to Dellow and Cosh for their superb work. Wow. Great article Qris. The NHL head office needs to be cleaned out. Bettman and Campbell can eat a [male reproductive organ]. And that, ladies and gentlemen, is how it is done. Wow. This is fantastic. Truly eye-opening. Now hopefully we can spread the word somehow and start getting the big names to ask those questions. Oh look, Bob McKenzie just posted a long article. During the whole thing, no mention of Gregory Campbell or Dean Warren and his firing. Remember, this is the guy who made the egregiously false statement that "nothing was ever acted on, that we're aware of, because the referees that Colin Campbell complained about to Walkom, they're still working in the National Hockey League." I don't have a twitter account, but he does, and people ought to point out how wrong he is. Do the man a service before he keeps accidentally saying that the referees that Campbell complained about (mostly Warren) are still working in the NHL. The topics not covered in McKenzie's article are what reall backs up what you're saying here. McKenzie just wrote a defense of Colin Campbell. Seriously? He says the hockey community respects him. Was Willie Mitchell the only one who felt the way he did when he went rogue at the end of last season? He says Campbell's a child of the old-school game, but it doesn't read as evidence he's a strong part of the hockey community. It reads as evidence that he's out of touch with where the game is now. Great post, Qris. Looks like a lot of work went into this. i'm right there with you qris. it's absolutely maddening how mckenzie, duhatschek, friedman and others seem to be missing the most important questions. My prediction, there will be money and a living in this for you guys soon and deservedly so. Way to pull it all together Qris. No doubt the NHL will continue to muddy the water, so you probably have a few more chapters ahead. Awesome article, dude. Everyone's (female external genitalia)footing around the real issue here, that when it comes to (Lower Bowel) Campbell, there is no such thing as "just venting" to the Director of Officiating. Don't let this story die. Qris's original comment, which spawned this article, received a mention. Everybody go there now! Ah. This new information means I need to either revise the blog or post a follow-up. I'm leaning towards revision, since I don't want to leave inaccurate details up in what would otherwise be some good work. I will, though, note my mistake and credit both Dellow and the dude that did the further investigative work. I don't think Bob McKenzie needs to issue an correction for saying "the referees that Colin Campbell complained about to Walkom, they're still working in the National Hockey League"... I think it's pretty clear he means the OTHER Referees that were mentioned in the e-mails, not Warren, especially considering these e-mails were made public at Warren's "wrongful TERMINATION" hearing... honestly, does that need to be spelled out for you? No WayneC, it was an absurd comment for Bob McKenzie to make in the first place. The contentious e-mails were the ones McKenzie was referring to and those e-mails did lead to the firing of Warren. Qris's point is that complaints directly relating to Colin Campbell's son and his team impacted the firing of Warren. McKenzie is trying to deflect criticism of Campbell by claiming that the contentious e-mails did not actually lead to anyone getting fired, so what's the big deal? His argument is untruthful. 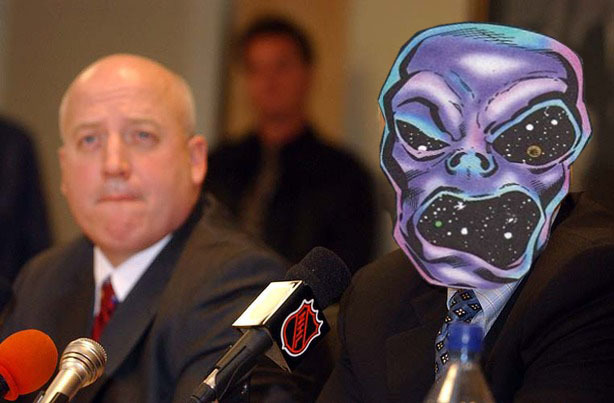 "Of course Colin Campbell didn't let his grudges impact his decision not to suspend Matt Cooke. Campbell isn't that kind of idiot." Guess I see the world differently because I assume everyone's an idiot unless proven otherwise. Still I think you've explained the impropriety better than anyone out there. This piece shames the mainstream media. In my head, this blog post was originally titled "Colinoscopy." I decided that'd be a poor choice. What's the Story With Mason Raymond? Big Numbers: 3 Things That Are, Like, Whaaaaat? Do the Canucks Finally Have a Third Line?